edddison is a brand new product. edddison is a brand new product. It offers a cutting edge way to interact with 3D files. Since it is so new, we think some introduction is required to understand the product. Over the next few weeks, until the start of the beta phase, we will be taking a look at the products and applications and how to use them. But first of all, let me tell you the story of why KOMMERZ invented edddison. All my friends were playing first-person shooter games like Doom. To be honest, I didnt care much about the games, but I thought wouldnt this be a useful technology for visualizing our own design projects. It was during this time that we came up with the idea of using a game engine for visualizing buildings. But the problem was that it was impossible for non-gamers to make a walk-through in a 3D model using a keyboard and mouse. A solution had to be found. We were designers and architects, so we didn’t know how to find a technology to do that. The idea was still in my mind and we did some design studies at the office. Then one day a friend of mine told me how a camera can track real objects with markers (bar codes) on them. We decided to use well-known printed floor plans for orientation combined with a 3D view (game engine) on a screen. Thus, the mixed reality interface was born. We then incorporated the use of real objects related to a digital 3D model, which came to be known as the Mixed Reality Interface (MRI). It has taken years of hard work and dedication to obtain R & D funding and commercialize the product. Thanks to the great Austrian public funding system, we could develop this technology. In 2008, we achieved our first revenue. In the beginning, we focused on creating and selling whole solutions consisting of hardware and real-time 3D applications. In this way, we became 3D specialists for real-time applications. People loved the applications and asked how they too could produce their own interactive applications. Our answer at the time was frustrating: It is difficult, and programming skills are needed. edddison is our new answer to the question. 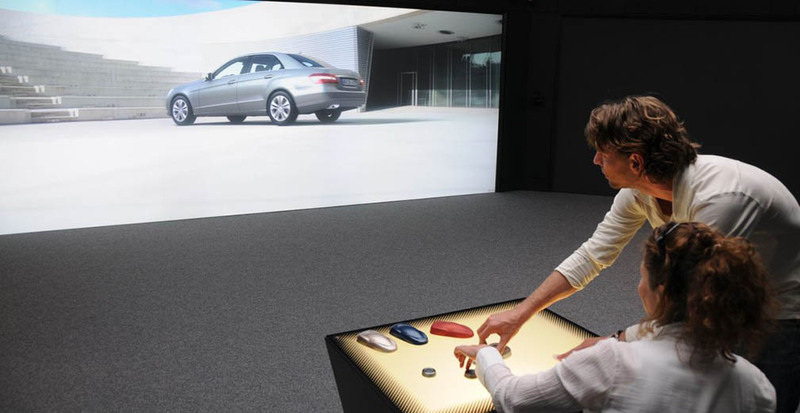 In essence, we want to enable our customers to create their own 3D apps controlled by tangible objects (web cam), tablets or touchscreens.